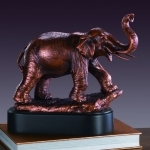 Elephant Statues - Click on an item for more details! 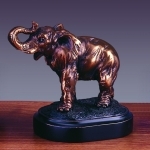 This beautiful elephant sculpture is handcrafted of brass with the highest quality and innovative design in mind and represent a unique value while beautifying any room at home or in the office. 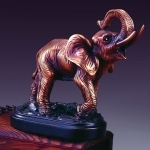 brass/wood, 9.5 inches H. x 14 inches W.
This beautiful Elephant Wine Holder is hand made from the finest poly resin. 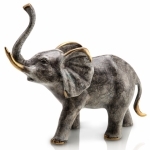 Then it is meticulously hand painted with stunning detail. So realistic it almost appears that you can see the Elephant Breath! 9.5" H x 14" W Wine bottle not included.